Shooting out cop tires sounds like loads and loads of fun. Anarchy sounds good to me. Then someone asks, who'd fix the sewers? Economy is looking bad, let's start another war. How many liberators really want to be dictators? If we fight each other, the police state wins. No wonder others hate us and the Hitlers we handpick to bleed their people dry for our evil empire. Thank you for your toilet paper, but your flag is meaningless to me. Walked up the Hill to touch it, then I unzipped my pants and pissed on it when nobody was looking. We are gathered here today to take photos of the President pretending to mourn. We want people boiling for revenge in their living rooms so we can go play shoot-em-up anywhere we choose. New Updates! (4/22/2019) We've been working really hard on completing our membership system so you can submit quotes and keep track of them. Once this is complete in the coming weeks there will be a lot more quotes by Dead Kennedys and other authors. 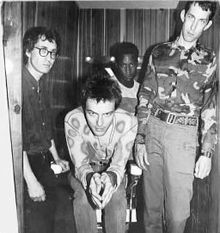 We've also changed the sorting on the site so you now see the latest Dead Kennedys quotes first. Our goal is to have the best Dead Kennedys quotes on the web!